Last Friday Argo Group announced that is successfully completed the share repurchase program that was started on the 30th of March. In just three months time the company spend £1.96 million repurchasing 19.0 million shares (28.1% of the outstanding shares) which is pretty impressive considering that insiders owned 33.2% of the share capital and on the AIM market average daily volume is around 60 thousand shares a day. Apparently there was plenty of liquidity off-exchange using block trades. I have mixed feelings about the successful share repurchase program. It’s good that they managed to buy a large amount of shares at a nice discount to NCAV which is nicely accretive to intrinsic value. At the same time I’m worried that the management team didn’t do this share repurchase program to create value, but to solidify their control of the company. 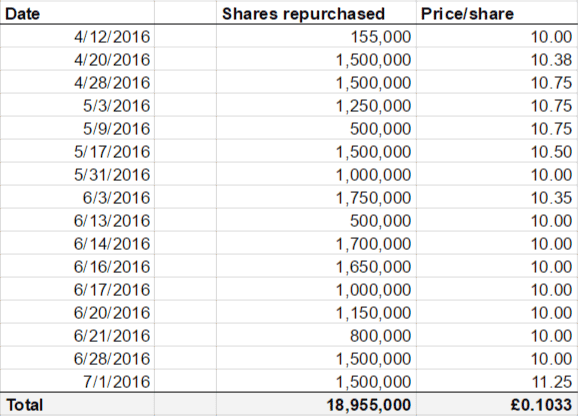 Thanks to the repurchase program their ownership went from 33.2% to 51.2% without paying any control premium to minority shareholders. I don’t really like this, and that is why urged people earlier this year to vote against the share buyback proposal. Unfortunately the vote passed, and I now have to accept that I’m even more at the mercy of the whims of the Rialas brothers than before. This entry was posted in Portfolio and tagged ARGO.L on July 4, 2016 by Alpha Vulture. It’s the first of July and that can only mean one thing: it’s time to look at the performance of my portfolio so far. I think 2016 has offered the most challenging environment for investors since I started this blog, although that is more indicative of the lack of market turbulence in the previous years than the seriousness of the crises this year. In the middle of February things were not looking very good with global stock markets and my portfolio down roughly 10%, but both managed to recover. Last week was interesting as well with the unexpected negative result of the brexit vote, but fortunately(?) the market impact (so far) is smaller than I expected. As you can see the MSCI All Country World Index (measured in euro’s) is down a tiny amount while my portfolio is up in the high single digits. I think this is a fantastic result. In absolute numbers it’s already more than satisfactory and compared to the benchmark it’s really great. I always wrote that I expect that my portfolio would do relatively well in a bear market, and it’s good to see some confirmation of this. I should add that I’m actually under-reporting my performance somewhat since my brokers values CVRs at zero even though I spend money acquiring them (e.g. ALXA). This subtracted approximately 64bps from the results. I’m pretty happy with the performance of the majority of my positions this year with Conduril being the obvious exception. The stock dropped 45% from a price of €56/share at the start of the year to €31/share now. There are some good fundamental reason why the stock has been getting cheaper, the main reason being the big exposure to Angola that isn’t doing too well since oil prices dropped. At the same time the stock is now trading at just 37% of NCAV (if we include some loans to Portugese companies that are classified as non-current assets). Because of that I decided to increase my position in the stock recently, although I’m at the moment not as willing to bet big on it as a few years ago. At that time it was also very cheap, but with less assets and (way) more earnings power. Now the distribution of possible future outcomes is more binary which makes it sensible to allocate not too much capital. 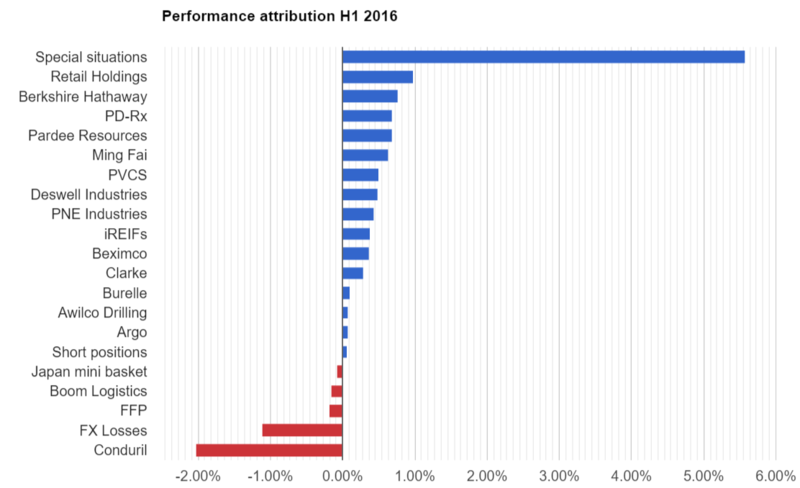 Also nice to see is that Retail Holdings is at the top of the list with regards to performance since I called it my best idea for 2016 on Seeking Alpha. 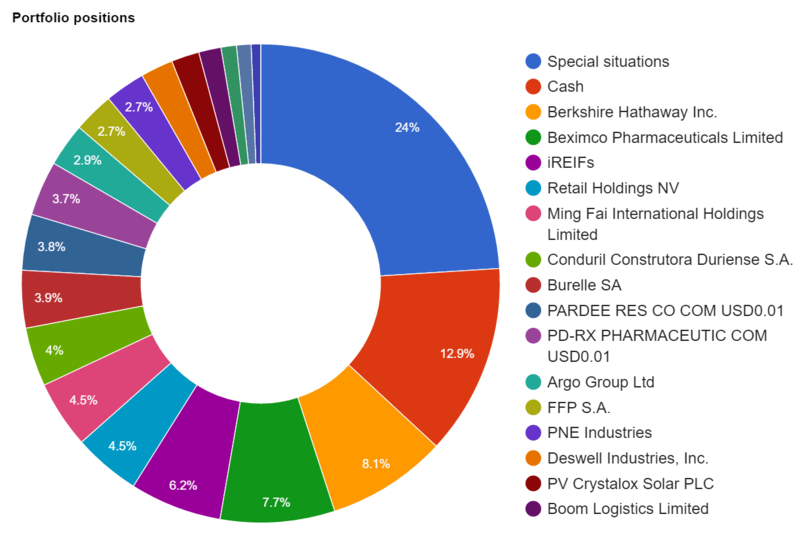 As you can see my portfolio is currently positioned conservatively with a big allocation to special situations (that usually are less correlated with the overall market) and cash. While my allocation to special situations varies throughout the year I think this is reasonable representative for the first six months of 2016. I think I can be pleased that assets that made up just 25% of my portfolio generated the majority of my overall performance. Unfortunately I cannot simply allocate more capital to this category because there are usually a limited number of attractive deals in a given time period that I can find. Kahala Brands is for example accounting for roughly a third of the special situations portfolio right now which is certainly as big as I want to go. If anything that might be a bit on the too big side already since the spread has already narrowed significantly since I first posted about the idea. But with an expected close in roughly one month time while the spread is still 6% selling just feels wrong. This entry was posted in Portfolio on July 1, 2016 by Alpha Vulture.